It’s a good time to be a silly superhero, with Amazon producing a brand-new Tick series, Section 8 making a dingus of the Spectre a few Wednesdays ago, and a new Slapstick comic from Marvel this fall. Let’s celebrate with this immense ranking of characters created to mock Superman, Batman, and the rest. Because they totally had it coming. Ben Edlund’s The Tick takes the top spot, not just for its endearing and erudite lead, but because it’s been great as a comic, a cartoon, and live-action TV series—and Amazon’s new version looks good, too. The other reason The Tick takes the top spot is because of the numberless great supporting characters populating the city he’s sworn to protect—the aptly named “The City.” To name just a few: Die Fledermaus, Pigleg, El Seed, Chairface Chippendale, Oedipus (a paody of Elektra), and so many more. If you have to watch one Tick adaptation, though, it’s got to be the original animated series. Chairface Chippendale began etching his name in the moon in the very first episode, managing to write “CHA” before the Tick stopped his evil plan. The moon stayed vandalized for all three years of the show. (And had a bite taken out of it by a Galactus parody, too.) Spooooon! Constantly derided by his parents as “a fat little nothing,” the strangely laconic, bowl-cutted boy named Herbie is secretly the world’s greatest superhero. Endowed with limitless supernatural capabilities and an abiding love of lollipops, Herbie—who made his debut in a 1958 issue of Forbidden Worlds—manages miraculous feats such as walking on air, banishing ghouls to their home dimension, communicating with animals and inanimate objects, and even bird-dogging the affections of Jackie Kennedy (while President John F. Kennedy was in office) every time he leaves his house. Beginning as a parody of 1980s comic book trends, TMNT responded to the dearth of teenagers, mutants, and ninjas by adding “turtles” to the mix. The franchise, created by Kevin Eastman and Peter Laird, set the world on fire; mutagen ooze, a stately underground lair located in the sewers, Dimension X— almost everything about the series is iconic. While various elements were introduced by the extremely prolific David Wise for the 1987 cartoon series, even he had a hard time keeping up. Demand for new product introduced dozens of conceptually interesting “direct-to-action-figure” characters with unattached stories the franchise has still yet to properly explore. The Ninja Turtles may not be parodies anymore, but that doesn’t make their original inspiration and creation any less brilliant. A “cool youth deacon” and spokesman for a line of crusty bread shavings, Pastor Toastman fights injustice as the superhero Powdered Toast Man, at least during episodes of the Ren & Stimpy show. PTM will often dismiss authority and cause world-reaching calamities for the sake of his own personal code of ethics. He once admonished the president to “drop the crayon, farm boy!” as he was signing a peace treaty, and commanded the Pope, “Quickly, man! Cling tenaciously to my buttocks!” before flying him to safety. When replenishing supplies of powdered toast, he will scrape a dull butter knife repeatedly against his retractable, drawbridge-like face. Powdered Toast Man even battled Spider-Man in a licensed story from Marvel Comics, written by Dan Slott, years before he’d become the character’s mainstay scriptwriter. Garth Ennis’s collective of dangerously psychotic if well-intentioned superheroes is always a good time, but hearts and minds definitely belong to the self-descriptive Dogwelder— a flawless character concept both horrifying and ridiculous. Where’s the Ennis-written Batman vs. Dogwelder: Melt With You miniseries, DC? DC’s precursor to Deadpool, the self-aware, fourth-wall breaking Ambush Bug began his career as a villain before turning to the side of good. I’d argue the character’s highwater mark was his appearance in the series finale of Batman: The Brave and the Bold. Voiced by Henry Winkler, Ambush Bug alerted Batman that his fifth-dimensional adversary, Bat-Mite, had grown weary of the series formula and planned a grittier, CGI-reboot—broadcasting the upcoming, (ill-fated) Beware the Batman which followed. A veritable Frankenstein’s monster reconstructed after a fatal car accident, Mike Allred’s gorgeously illustrated Madman gleefully toys with convoluted story arcs and pop culture references. He also teamed up with Superman once to stop Mr. Mxyzptlk in a rare crossover event with DC. Often considered a shameful ripoff of Madman, the visually similar Freakazoid would go in a different direction entirely, cold-opening episodes of his own cartoon with a shot-for-shot recreation of the classic B-horror movie The Crawling Eye, or giving actor David Warner his own five-minute musical number. Freakazoid also racked up a pretty interesting rogue’s gallery, particularly the meme-worthy Candle Jack. A cross between the Shadow, the Crimson Avenger, Batman, and an anthropomorphic duck. Disney’s Darkwing (or DW, for short) was the terror that flaps in the night, the batteries that are not included, the wrong number that wakes you at 3am, the fingernail that scrapes the blackboard of your soul, etc. He also battled some interesting foes during his days on the Disney Afternoon cartoon block in the ’90s—especially the Liquidator, a dog made of water that spoke exclusively in advertising copy. A surrealist superhero and indie comic darling created by Bub Burden, Flaming Carrot’s origin reads as follows: “Having read 5,000 comics in a single sitting to win a bet, this poor man suffered brain damage and appeared directly thereafter as—the Flaming Carrot!” His disproportionately huge, carrot-shaped face is certainly a startling visual, but your mileage will vary. He punches people and they die. A parody of overwrought manga and anime storylines, One-Punch Man sort of develops its own mythos in spite of itself, but it somehow never gets old seeing the immensely powerful/total goofball Saitama as he defeats the most evil, powerful enemies the world (and universe) has to offer... with one punch. Every single time. Star of his own under-appreciated surrealist superhero series from DC Comics, Keith Giffen’s Heckler was lost in the shuffle of an era saturated with surrealist superhero series from DC comics. Still definitely worth checking out. An impossibly dickish superhero performed by the affable Nathan Fillion in Dr. Horrible’s Sing-a-Long Blog. Naturally, Hammer’s namesake refers to a certain part of his anatomy. 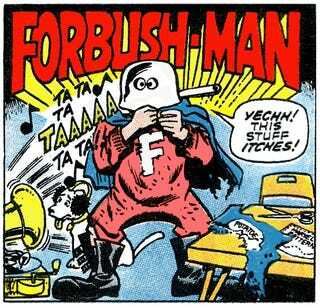 Marvel’s satirical superhero of the 1950s and ’60s, Irving Forbush took to fighting crime after his aunt, Auntie Mayhem, bludgeoned him over the head with a cooking pot. A team featuring the flatulent Spleen, the highly specific Shoveler, and the Bowler, who carries her dead father’s skull inside a bowling ball, and was actually co-founded by Flaming Carrot in the Flaming Carrot comics. Somehow they made their way into a 1999 movie that was pretty good, and yet almost nobody saw it. But how could anyone not like a superhero team featuring Paul Reubens, Kel Mitchell, Janeane Garofalo, and William H. Macy? Created by “Morty Mann” and portrayed by late character actor “Dirk Richter” on an ill-fated TV series, The Simpsons’ resident megapopular superhero Radioactive Man fights crime with his sidekick, Fallout Boy, using the power of “clean, nuclear heat.” His adversaries include Dr. Crab, Swamp Hag, and the Paul Lynde-esque Scoutmaster. Star of his own excellent cartoon series in the ’60s, the patriotic Ramjet was a boon for limited animation and semi-improvised dialogue—concepts practically dominating today’s comedy and animation landscapes. Found in the pages of Dave Sim’s magnum opus Cerebus, the Cockroach was Sim’s mercurial parody of whichever popular comics character he was angry at that week. Aliases included Captain Cockroach, Moon Roach, Wolveroach, Punisheroach, and Swoon—a parody of Dream from Neil Gaiman’s Sandman. The character could be very funny, at least in the beginning before things got... unfortunate. In Takashi Miike’s excellent homage to the tokusatsu genre, Zebraman is a third-grade school teacher who fights crime as his favorite childhood hero. The movie was followed by a sequel, Zebraman 2: Attack on Zebra City. Damon Wayans’s hero and his sidekick, Other Guy, battle the corrupt “Suit” in this 1994 film. A bomb at the box office, the movie gained a cult following after making the rounds of cable television. A deranged man from Queens, New York, who fights clogged drains and makes sure children cross the street safely in the DC Universe. His best friend is a humanoid beagle who writes for BC Comics. An alcoholic superhero played by Alan Arkin in the excellent cult film Return of Captain Invincible, directed by the equally excellent Phillipe Mora (The Howling III: The Marsupials; Pterodactyl Woman from Beverly Hills). It’s a musical featuring Christopher Lee as a dog turd-planting supervillain named Mr. Midnight. See it immediately. He’s supremely humble and lovable, but he gets a demerit for his 2007 movie starring Peter Dinklage as Simon Barsinister. A very difficult 84 minutes to get through, even for dog-loving kids. From one who knows. Steve Harmon became a living cartoon character after stepping into a magic mirror and being torn across 3,741 dimensions. His body is composed of a substance called “electroplasm,” granting him the powers of squash and stretch physics. A new series from Marvel Comics is on the way, and it looks like a lot of fun. Scatman Crothers as a kung-fu master crime-fighting dog. Unimpeachable. The children of the Freedom Brigade—themselves a parody of the Justice League—Merryman, Awkwardman, the Blimp, White Feather, and Dumb Bunny comprise this team. They even have their own evil doppelgangers: Jongleur, Tremor, Hindenburg, Splitshot, and the Lagomorph, respectively. Robert Townsend’s pleasant superhero comedy has an amazing cast, including Frank Gorshin and James Earl Jones. But that can’t undo the fact that it runs an astronomical-for-the-material 142 minutes. Cute show from the creator of Get Smart! starring William Daniels as a nice-guy hero. Followed the similar Mr. Terrific on NBC in 1967. Bob Kane’s other, less popular creation, Cool McCool was a riff on James Bond who—bizarrely enough—battled a roster of supervillains that would have fairly direct analogues in the Batman books starting with DC’s New 52. They include the Owl (Talon), Jack-in-the-Box (Dollmaker), the Rattler (Snakeskin), Greta Ghoul (Gretel), Madcap (White Rabbit), and Hurricane Harry (the Weeping Woman). Go figure. South Park co-creator Trey Parker’s reluctant Mormon superhero fights adversaries like A-Cup and Neutered Man with his unique “hamster style” of martial arts. The movie has the trademark South Park style of humor, but in terms of specifically parodying superheroes it’s not especially cutting. An actual humanoid bat, Bat Fink fights crime with his chauffeur, Karate, who’s either a scathing commentary on Asian manservants like Kato, Oddjob and Wong, or merely a misguided racial caricature, depending on how the episode is written. A snot-themed character starring in his own “pick and flick” adventure vide game from Interplay. It was fun-ish. MC Hammer’s crime-fighting avatar had 13 episodes of his own Saturday morning cartoon series. Erotica Jones is a stripper by night who fights crime even later at night. Created by Stan Lee for Spike TV. Forgive him. Rock star Lonnie Lord and his best friend Titus Twimbly fight crime as Rat Pfink and Boo Boo in director Ray Dennis Steckler’s 1966 film. Initially a straight crime drama called The Depraved, Steckler created the duo after he grew bored while filming and decided to a Batman parody instead. Consequently, the film radically changes tones 40 minutes in. The crime half is terrible, the “superhero” half is worse. Are they gay? I don’t know! It was funny in 1996. Did we leave out one of your favorites? There are a lot of these guys! Sound off in the comments to voice your any we forgot.